Home / Maroon 5 / music / video / [Video] Maroon 5 crash real weddings for music video! [Video] Maroon 5 crash real weddings for music video! If it's your wedding day and Maroon 5 suddenly crashed it, would you react like how this real-life brides and grooms did? Coming up with a fresh concept for a music video is always hard when there are thousands of videos out there that have explored almost every theme and idea in mind. But we don't believe a band has ever crashed real-life weddings to perform their latest single and well, that's what Maroon 5 did for their latest single, "Sugar". Fronted by Adam Levine, the band teamed up with "The Wedding Crashers" director David Dobkin to surprise couples on their special day. What the guys did on 6th December 2014, was to literally drive across Los Angeles one fine day and walk-into wedding venues to the utmost surprise of the celebrated couples and their lucky guests. 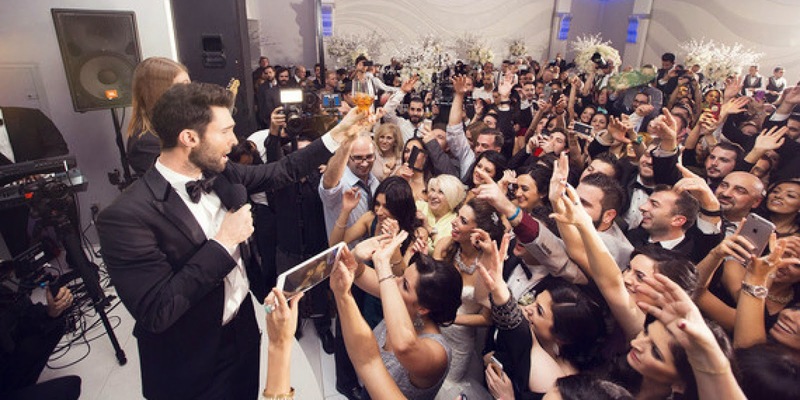 How would you react if Maroon 5 suddenly showed up at your wedding and started playing their song?